Distilled alcoholic beverage is a generic term for all kinds of alcohols made from starchy materials like grains, fruits or vegetables via distillation. 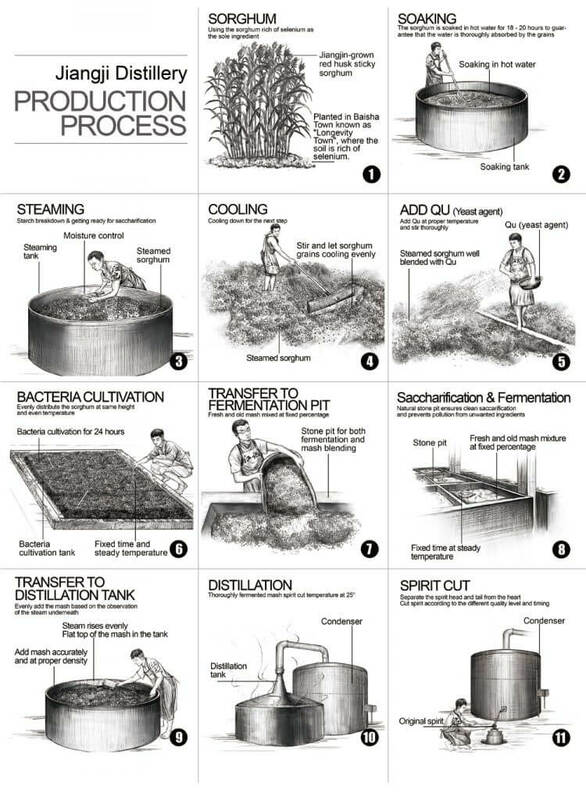 Necessary steps before distillation include saccharification and fermentation, whereas aging and blending are steps that can be applied after the distillation. Spirits can be divided into three main categories: regular spirits, blended spirits and compound (infused) spirits. Regular spirits just follow the standard processes of fermentation and distillation. Blended spirits are a mix of two or more liquors with different fermentation bases or mashes, as famously seen in whiskeys. Compound spirits are a synthetic mix of alcohol and added flavoring or sugar. Distilled alcoholic beverages always go with rich-in-starch raw materials, such as sorghum, corn, barley, wheat, rice, potatoes, etc. as the base. The distilling process is roughly divided into two steps: the first step is decomposing the starch into sugar by use of microbes, known as the saccharification process; the second step is to ferment the sugar (glucose) by using yeast to produce alcohol. The thick aroma of spirits is attributed to the fact that esters, higher esters, volatile free acids, acetaldehyde, furfural, etc. are generated in the fermentation process. Most of distilled products mainly compose of ethanol, water and about 2% aroma substances. These fragrant substances in the liquor and their respective proportions make liquor different from pure alcohol and give each liquor their own flavor profile and style. The flavor substances in distilled spirit are mainly alcohols, esters, aldehydes, ketones and aromatic compounds. 1. Solid-state fermentation. Solid-state fermentation refers to a method of fermentation using microorganisms on a solid-state matrix with no or substantially no free water. The gas, liquid and solid phases of the solid matrix coexist in three phases, i.e. the porous solid matrix contains water and water-insoluble substances. 2. Semi-solid state fermentation. It is characterized by the early stage of saccharification with solid-state bacteria, followed by liquid fermentation, and then liquid distillation. 3. Liquid-state fermentation. It refers to liquors distilled mainly through liquid-state saccharification, liquid-state fermentation and liquid-state distillation. By using red sorghum planted on the selenium-rich local soil as single raw material, Jiangji Distillery distilled light-aroma gaoliang liquor through aspergillus transformation and single distillation. To get a proper base for fermentation, the sorghum needs to be cleaned, soaked and stewed. After adding fermentation agent small qu and local pure soft water, cultivation in the quartzite pits can start. By use of microorganisms, starch raw materials are saccharified and fermented. The starch is then decomposed into glucose by glucoamylase in the rhizopus and aspergillus (fungus). The glucoamylase produced by the yeast components of small qu transforms the glucose into alcohol and carbon dioxide as well as other substances, such as acids, alcohols, esters, aldehydes and aromatic compounds. After fermentation, the liquid is taken from the fermentation pits to remove impurities; the result is base liquor. By adding sugar and water to the base liquor and mixing them well, liquid turbidity is removed, alcohol content brought down to industry standards and the desired liquor texture achieved. After thorough quality control, it should be stored for more than 30 days. Finally, the light-aroma baijiu is ready for consumption.